Partially disbanded British music label V2 has signed a deal with We7.com . It will allow the music service to distribute its vast back catalogue of albums over the web for free, and without DRM protection. We7 is former Genesis-frontman Peter Gabriel's music site which distributes free music, in a service which is funded by advertising. 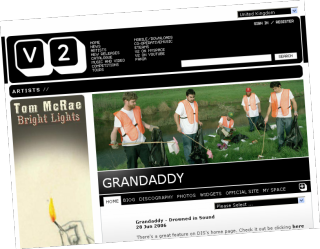 V2's back catalogue includes albums from artists such as The White Stripes, Mercury Rev, Grandaddy, Stereophonics and Bloc Party. Music from all these bands will now be available free-of-charge and protection-free from We7. We7 adds 10-second adverts onto the start of each music track it gives away. This generates income for We7, which enables it to pay music labels for using their music. V2 has joined the likes of English super-label EMI in embracing DRM-free music .